Tagline: The savage drama of an amazing double double-cross! 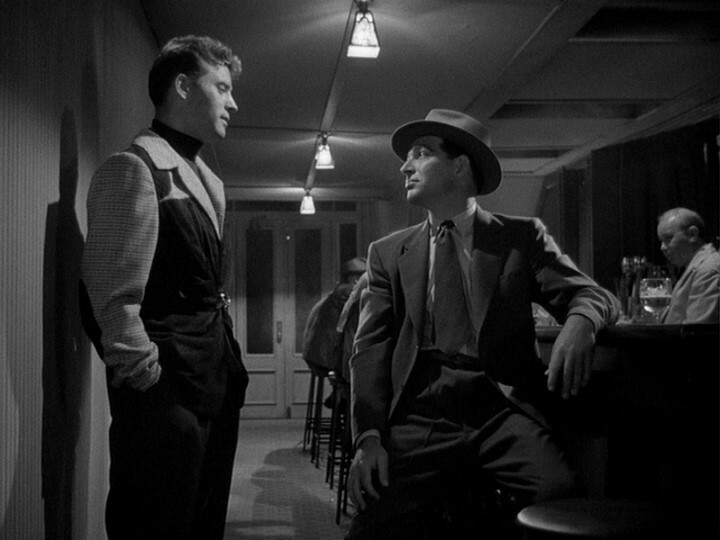 This meaty film noir is a follow-up to The Killers (1946). 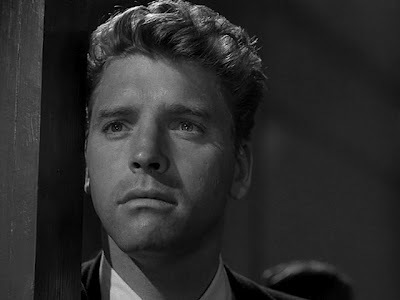 It reteams German director Robert Siodmak with star Burt Lancaster (age 35 here), who once again finds himself in a deadly love triangle. Lancaster, cast against type as a loser, Steve Thompson, a man who returns to his native LA after a year of wandering about the country. 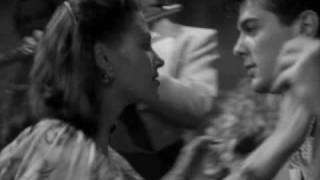 He doesn’t call up his ex-wife, Anna (Yvonne De Carlo), but they bump into each other. Steve still “has her in his blood,” much to the dismay of his mother. Maybe it was bad luck? Or fate? 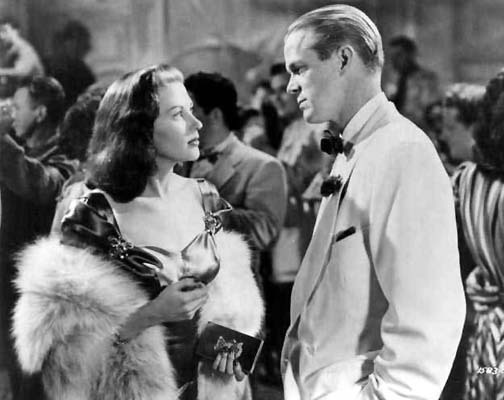 Anna and Steve rekindle their relationship for a time, but then she sneaks off to marry gangster Slim Dundee (Dan Duryea), who operates out of a local bar/nightclub. Steve almost can’t believe his ears when the sympathetic bartender breaks the news. Does Anna only care about money? This is also the film debut (not credited) of Tony Curtis, who dances in the rhumba scene. Later, Curtis and Lancaster would costar in Trapeze and Sweet Smell of Success. This film is unusual for the genre, because Steve is not a loner, with no one to look out for his well-being. He has a loving family- mother, jovial little brother, and future sister-in-law. He has a good friend in Lt. Pete Ramirez, a cop he’s known since childhood. The many minor characters lend flavor to this film. In time, he draws himself into Slim’s sphere, proposing an armored car heist. 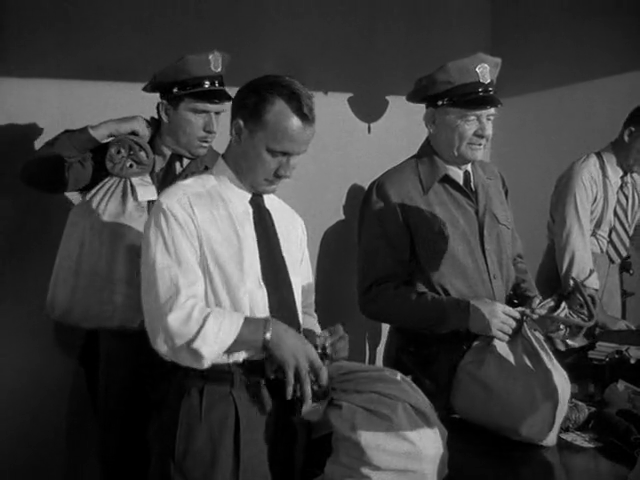 This heist involves a elderly co-worker who’s seeing his widowed mother. The main action scene was very well-done, as it looked quite modern. Anna is not like a typical femme fatale, as she’s not the planner. Steve takes agency in the robbery, though he never wanted anyone to be killed, if possible. He thinks naively, as he “wasn’t born into this” (Pete comments). He cared about love, not the money. The last quarter of the film is atmospheric, intense, and very well done. Anyone can become a fool for love, even Lancaster. Look at how young/sad/lost Steve looks when he sees Anna in the club (dancing carelessly) after so long. This is a fine performance, layered yet accessible.